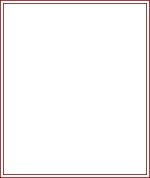 2nd Row - (Inc) 3ch, 2tr into each tr to end, ss to top of 3ch on beginning of row. Next Row - 1ch, 1dc into each dc along to head, miss ss, 1dc into each dc around face, miss ss, 1dc into each dc to end, ss to first dc. Fasten off. work 4dc into circle, pull loose end of yarn to close circle, ss to first dc. Fasten off. Mouth - Using 3.50mm hook and black colou r yarn, make 12ch. Fasten off. 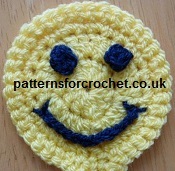 and place 1 tack in the centre to make a smile, (see photo above) sew in and tie off any loose ends. 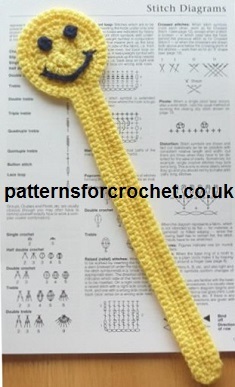 Hope you enjoy this free crochet pattern for Smiling Bookmark.